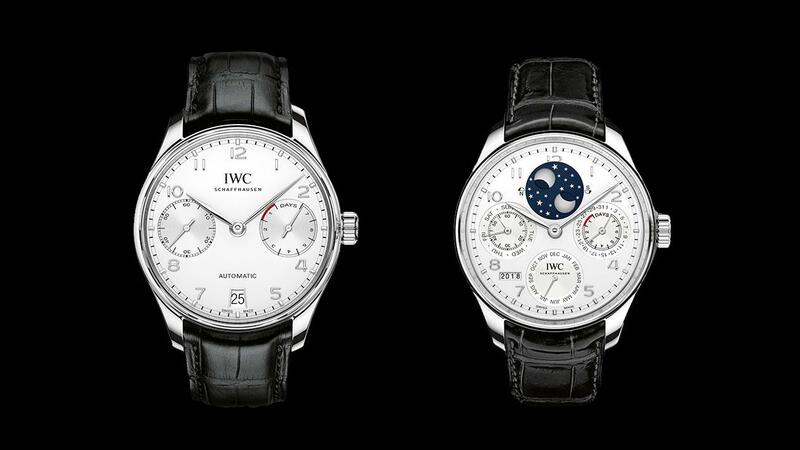 IWC’s new additions to its Portugieser collection include the Portugieser Automatic, left, and Portugieser Perpetual Calendar, right. IWC’s classic Portugieser collection is expanding with a new platinum perpetual calendar and a stainless-steel automatic with a silver-plated dial. The Portugieser line can be traced back to the 1930s, when two Portuguese wholesalers approached the watch company in Schaffhausen, Switzerland, about developing a stainless-steel wristwatch with the exacting precision of a marine chronometer. To attain the desired accuracy, the wristwatch was powered by a pocket watch movement, dictating its oversize dimensions. The first pieces were delivered in 1939 to a Ukrainian watch wholesaler. It was not until three years later, at the height of World War II, that the Portugieser finally made its way to Portugal. The large-scale model with its clean lines, Arabic numerals, and Bauhaus aesthetic became IWC’s most recognizable design. And while it has been tweaked here and there with different variations over the decades, this year marks the first time that IWC has married Kurt Klaus’s ingenious perpetual calendar movement with a hefty platinum Portugieser case. The new Portugieser Perpetual Calendar, ref: IW503406, is priced at $53,300. Launched in the 1980s, the elegantly designed IWC 52615 caliber, with only 80 parts, displays day, date, month and moon phase, all easily adjusted via the crown. As a perpetual calendar, the movement can automatically adjust for different month lengths and leap years until the year 2100 without need for correction. The high-precision, double-moon phase shows a mirror-image representation of the moon phases for both the northern and southern hemispheres. The moon phase is so accurate that it theoretically can track the actual lunar orbit for 577.5 years, after which it would deviate by only one day. On display through the sapphire-crystal case back, the automatic movement is equipped with a Pellaton winding system fitted with durable ceramic components that generate a seven-day power reserve with an oscillating rotor made of 18-karat red gold. The same winding system, albeit without the solid gold rotor, powers up a sleek new version of the Portugieser Automatic ($12,700) in a stainless-steel case with a silver-plated dial and slim rhodium-plated hands. The ref. IW500712’s elegant dial design plays up the appliqued Arabic numerals and the railway track chapter ring around the periphery.